Last August’s floods caused widespread damage that included over 100 lives lost, more than 15,000 homes destroyed and over one million people critically affected by the floods. Chin State was hit the hardest, and its capital Hakka was so devastated by flooding-related landslides that the regional government may be forced to relocate the entire city. Almost immediately, our team in Myanmar leapt into action, raising funds locally and serving as first responders. At the same time, donors in the U.S. responded generously, helping augment the immediate aid with critical financial support. In a crisis like this, Partners Asia relies on the strong grassroots networks of our staff and program partners to provide nimble, rapid aid, and they came through in a major way. 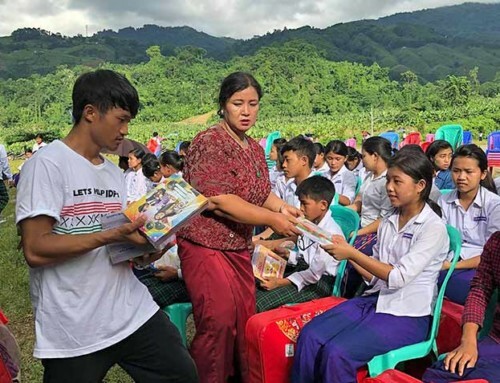 Rice, oral re-hydration salts, purified water packages and skin disease medicines were delivered by boat to five villages in Nyaung Tone Townships, located in the rice-producing Ayeyarwady Region west of Yangon. Throughout Chin State, relief workers in couldn’t reach remote villages with rice and other donated staples, so our emergency funding covered transportation costs for motorbikes and other ways to deliver the supplies. Additionally, Meikswe Myanmar, the organization led by our long-term partner Snow, delivered food and medicine to victims in Rakhine, and worked to repair damaged schools in Magwe. 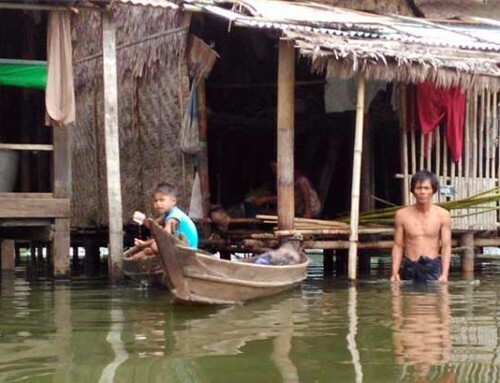 As the rainy season looms this year, communities are mobilizing to restore vital systems and mitigate future damage. 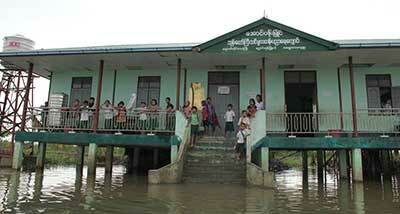 Partners Asia’s flood relief funds are augmenting the efforts of local organizations throughout the affected regions. We are supporting a massive tree-planting project in both Chin State and Magwe Region. Three local partners are working together to strategically plant thousands of trees to help prevent future floods and landslides. This project also includes capacity building training for local community based organizations to manage recovery efforts and prepare for future disasters. Another program is supplying water purification pots to hundreds of households in the Magwe and Sagaing Regions where water is badly contaminated. 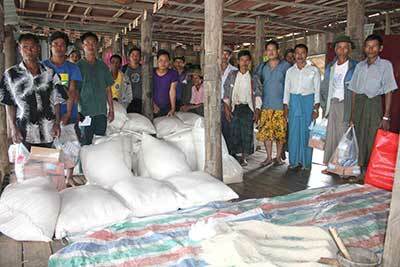 Relief workers prepare bags of rice for distribution. In addition to continuing with school repairs, Meikswe Myanmar is building rice banks for communities as they try to restore their paddy fields. This assistance helps ensure food security for townships and the economic livelihood of farmers, allowing families get back on their feet without resorting to predatory loans from money lenders. Finally, an important piece of their Partners Asia-supported work is supplying two water storage tanks to vulnerable villages to help maintain clean water access in the event of future flooding. 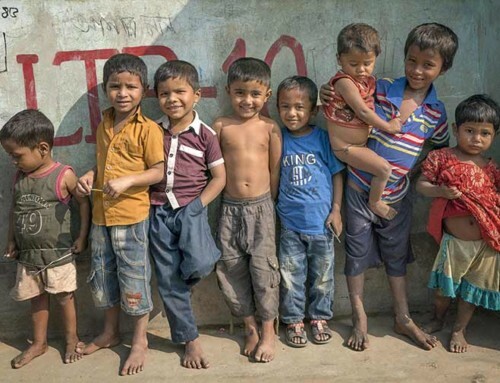 We are inspired the generosity of the people of Myanmar. In fact, Myanmar was recently recognized as the most generous country in the world by the CAF World Giving Index, with the United States 2nd. Within the country, communities less affected by the floods have rallied to support victims regardless of ethnicity and religious beliefs, and our donors’ support from outside has magnified their impact tremendously. The affected communities still face a lot of work, but these resilient and courageous people are making the most of what they have.